A couple weeks ago I put my Lensbaby on my camera and spent the day getting reacquainted. I went for a nice bicycle ride and got a handful of photos that I really enjoyed, this being one of them. I'm linking up this photo with Cari's Theme Thursday this week! I'm very much looking forward to seeing the selection of black & white photos over there. Oh, that shot is frame-able! I love it. Oooh. It is so interesting. The lines, the blur, the angles. Well done. I like that shot. It totally looks like it should be in a collection of "photos from the 50's" or something like that. Super neat. What is a Lensbaby? I love this picture so much that now I'm going to go Google "Lensbaby" and see if I can take shots like this. Oh a Lensbaby is a fun, relatively cheap lens that results in photos similar to what you would get with a toy camera. I've got the muse (http://lensbaby.com/lenses-muse) which is highly entertaining with its squeeze-to-focus mechanism. My favorite part about it is that it teaches me how to be more artsy with my photos. I'd definitely recommend it! Ha ha that sounds like that "mattababy" joke. Looks like the clothespins are dancing. love it. 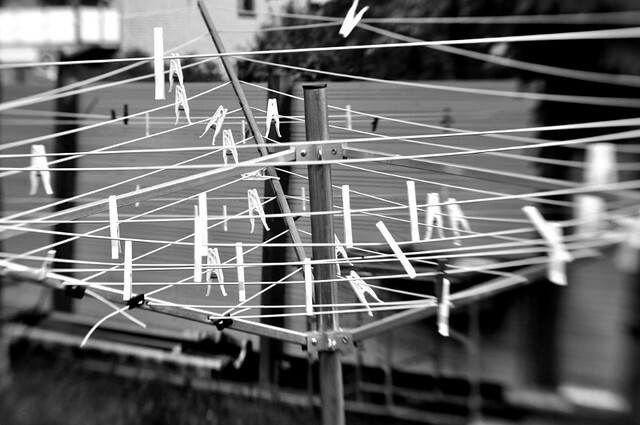 I want a clothesline like this so bad! I hate using the dryer in summertime because it makes the house so hot. Lovely photo. I want to frame and put in my laundry room Awesome. How cool! I wish I had a clothesline in the back yard. I love this so much. I wish I had something else clever to say about it, but I just love it. Really stunning. The lines criss-crossing and continuing off-screen combined with the depth of field that makes it look almost 3D. Such simple, everyday things transformed. They look like birds or some fantastical acrobats.